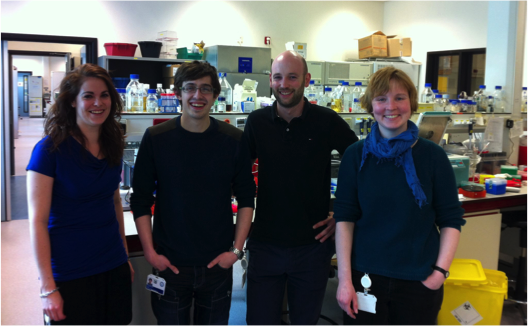 "My PhD project is jointly supervised by three people; Professor Steve Renshaw - where I do all of my work involving zebrafish and where I spend 90% of my time, Professor Simon Foster – who I go to for all advice and resources necessary for working with Staphylococcus aureus, and Professor Jos van Strijp – who also heads a S. aureus - based group at the University Medical Centre in Utrecht, the Netherlands. The idea for my project was created out of collaboration between Sheffield and Utrecht, and as part of this I visited Utrecht to work and meet the people who provided the basis for my project. Although I only visited for a month, I learned a huge amount about what happens there and having the chance to meet the people responsible for my project gave me a grounding and direction that I didn’t have previously. Much of my work there involved using flow cytometry to assess Ca2+ signalling within neutrophils and also cloning using Gibson assembly to try and create a new cell line for investigating the activity of various virulence factors. Utrecht was a wonderful place to live in and visit, the people there were very friendly and helpful, and in addition to the absence of a language barrier (a huge plus!) the science within the centre was top notch. I feel that overseas experience is something that is valuable to all people working in science, and I feel grateful to have had a chance to experience this during my PhD. I have plans to return to Utrecht again in the future, and in fact will be hosting postdoctoral fellows and PhD students here in Sheffield during the coming months. Outside of scientific obligation, it would be worth returning to Utrecht just to have the ribs at a certain pub I found!"